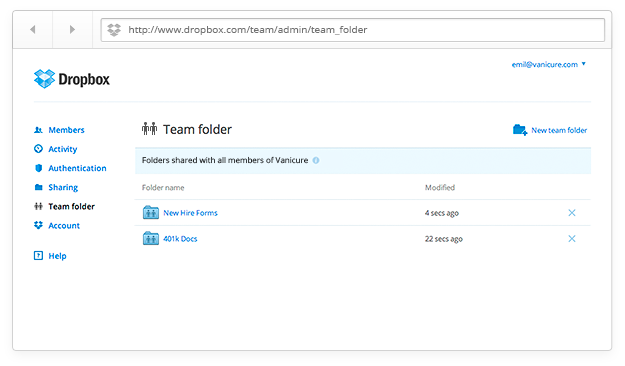 Dropbox today announced a new Dropbox for Business feature: team folders. Administrators can now create folders that are instantly shared with all members of their team, both current ones and new ones that join later. This means all important files that all colleagues need can be shared with the whole team in just one step. Furthermore, once a team folder has been created, all new team members will automatically get access to the folder as soon as they join the team. To create a team folder, head to the admin console, click “Team folder” in the left panel, and choose “New team folder.” Team members will get an email notification that they were added to a new shared folder. While team members can edit or move files in a team folder, just as they can from a shared folder, only admins can create and unshare the team folder. Dropbox gives a couple use cases for this feature, such as automatically sharing HR documents, training manuals, or prep materials for an upcoming company-wide meeting. That all seems great, but what about programming tools? As someone who has spent countless hours setting up my machine for a new coding environment every time I get switched to a new team, that’s what I want this feature to be used for. The best way to solve this problem is of course to get an updated image of your machine that includes all the tools your needs, but that only goes so far. These team folders could be potentially used to share all the installers and custom files that team members constantly need when setting up their machines or updating them as projects change and grow. What do you see this being used for?